Normal Foosball tables handle 2 to 4 players but our Giant Foosball Table can handle up to 16 players at a time, that's like having 4 regular Foosball tables not to mention the really cool light show. 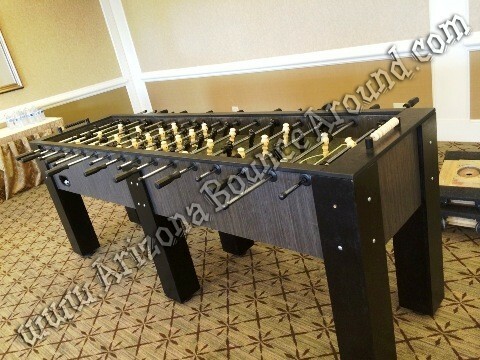 This Giant Foosball table will not fit thru regular doorways. It requires at least a 4-foot wide door, gate or pathway to get this game to your final destination. Add a Giant Jenga or Giant Connect 4 game to your order. 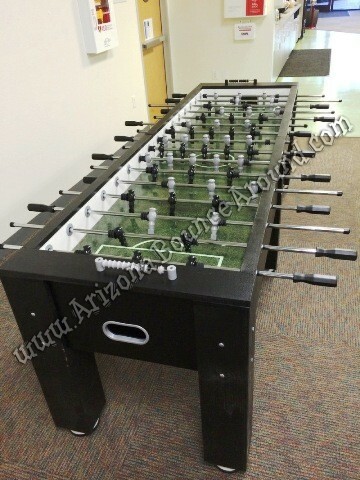 Our Giant Foosball table rental includes LED lights around the entire center playing surface and has an optional overhead light bar with seperate controls so you can have different colors top and bottom or seen here with UV lights for black light and glow parties.